November is upon us, and all month long we're working on building strength in our pull ups. Many of us walk into CrossFit not being able to do pull ups unassisted. The kip is helpful, it makes pull ups easier, and we can do more of them, and faster. These are all things that are very useful in CrossFit. However, investing some time and effort in your strict pull ups before you dive head-first into doing kipping pull ups will have significant pay-offs. 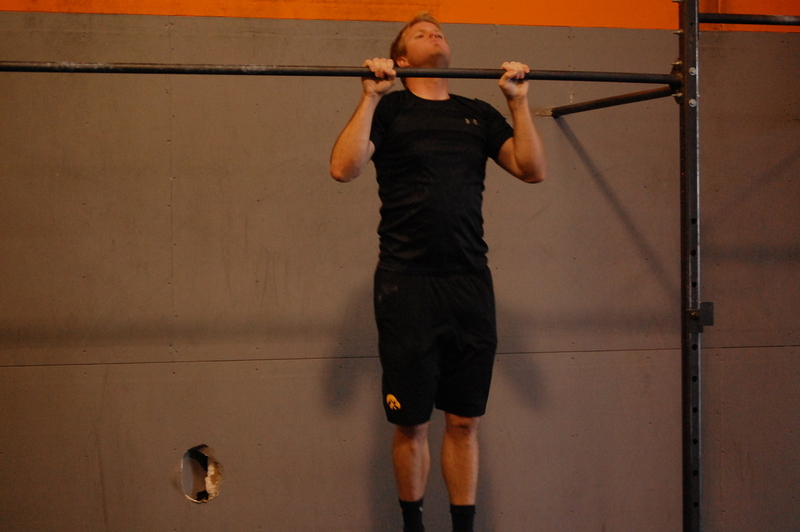 Strict pull ups or strict ring rows strengthen all your stabilizing muscles for kipping. There are a number of small muscle groups that protect the shoulder girdle (teres major, supraspinatus, teres minor, infraspinatus, levator scapula, and subscapularis to name a few), and they can get left out when we move too quickly into higher impact, high-repetition movements, like kipping pull ups. Giving these muscles some extra love and attention means you are lowering your risk for shoulder injuries, like slap tears, bicepital tears, shoulder dislocations, and glenoid labrum tears. If you are strong enough to do strict pull ups, you can keep your kip more efficient for longer. An efficient kip should stay within a tight window that remains close to your center of gravity. We've all been tired and on our last leg in a workout with lots of pull ups. As we tire, our feet kick out farther in front and behind us, we lose that hollow body position. Again, this puts more strain on our shoulders. So what's so wrong with using a band? Well, nothing unless you rely on it entirely. The bands are a great tool in our arsenal to building strength. However, if you are combining a kip with the band, it can become a crutch. This month, we're setting aside the crutch. Our trainers have a number of options for you to substitute and scale those pull ups. As a gym, we're excited to see the progress we can all make!